Michael is currently a major Category 3 hurricane. Additional strengthening is expected prior to landfall, and AccuWeather meteorologists cannot rule out the potential that Michael reaches Category 4 hurricane status. 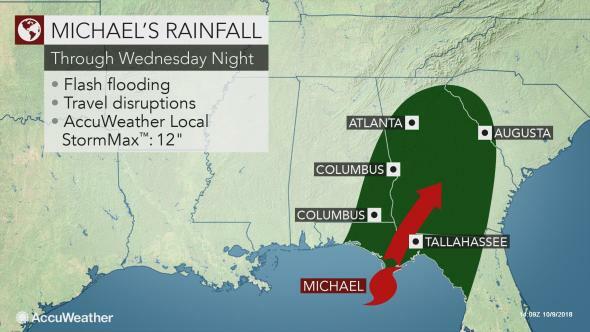 “We expect Hurricane Michael to make landfall near Panama City, Florida, Wednesday midday or early afternoon,” according to AccuWeather Hurricane Expert Dan Kottlowski. Residents and visitors are encouraged to heed all evacuation orders as they are given. 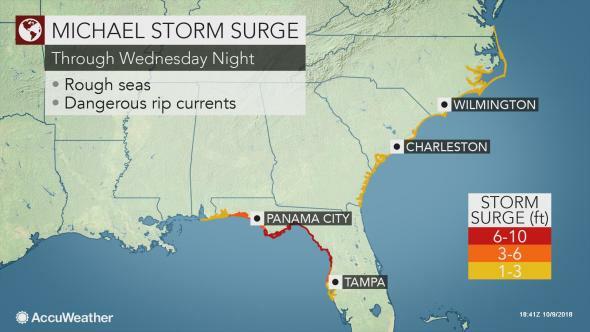 A significant amount of water will be funneled into Apalachee Bay and the stretch of coast between Cape San Blas and Fort Walton Beach, Florida. Interests in this area should be prepared for significant storm surge flooding that potentially may range between 8 and 12 feet. 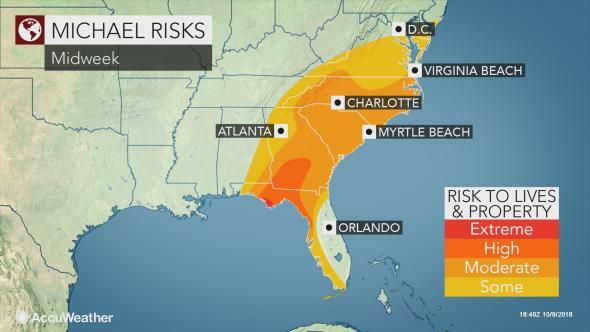 The heaviest rain will tend to fall in areas that were missed by Florence and focused from the Florida Panhandle to southwestern and central Georgia to part of central South Carolina. 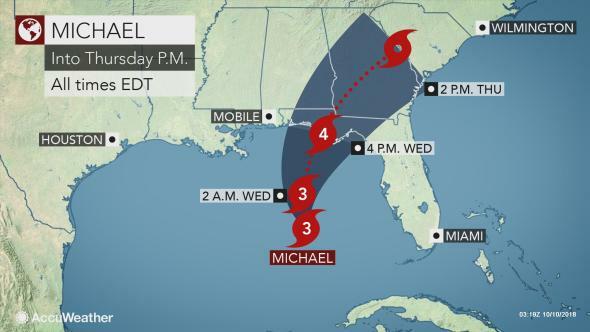 Adverse travel conditions may extend as far west at Interstate 85 as Michael rolls northeastward. Travel along U.S. Route 98 and I-10 in the Florida Panhandle may be dangerous and should be avoided from later Wednesday to early Thursday. However, enough rain will fall to cause urban, small stream and some river flooding in the region with a general 4-8 inches of rain. 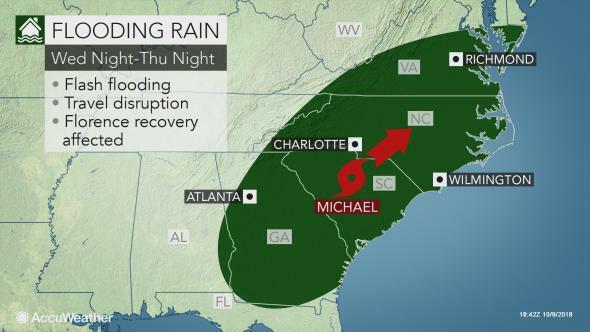 Some areas that experienced flooding from Florence are likely to face renewed flooding but perhaps on a lesser scale due to Michael’s forecast increasing speed. Some rivers may rise more swiftly than before due to the wet ground. 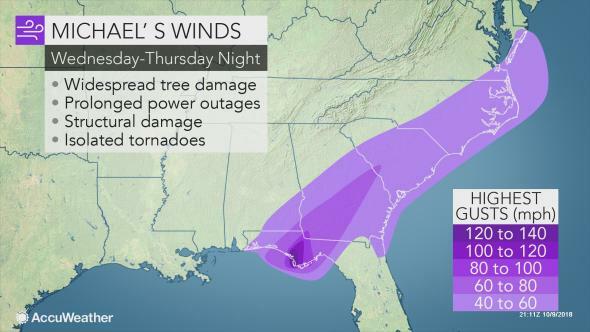 Even though Michael will weaken soon after making landfall in Florida, it may continue to have enough strength to cause damaging winds and isolated tornadoes along much of its path, especially near and east of the center from Wednesday to Thursday night. An easterly wind will push some water toward the coasts of northeastern Florida, Georgia, the Carolinas and southeastern Virginia. Interests in this area should be prepared for minor coastal flooding and overwash on low-lying roads and causeways from Wednesday through Thursday night. Elsewhere in the Atlantic, Tropical Depression 15 formed in the eastern Atlantic early Tuesday morning. The feature strengthened to Tropical Storm Nadine by Tuesday afternoon. Nadine does not pose a significant threat to land and is forecast to weaken in a few days.